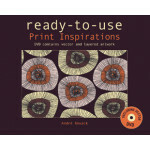 Nelly Rodi Print is one of the most populair books in the Nelly Rodi range. Nelly Rodi Prints is an amazing print book filled with unique, commercial and beautiful print designs. The book contains 4 different trend stories - each with colours, colour combinations, ideas for placement prints as well as all-over designs and lot of inspiring materials. The creative lay-out, the many fabric swatches and the commercial yet inspiring print deisgn all help make this book a perfect working tools for all print designers.